This article was printed from http://propel.mdat.org/category/fundraising/. “I have traveled the country speaking and meeting with college students from 150 colleges, teaching God’s heart for the world and challenging people to live missionally,” says Josh Cooper, author of the 2013 book Hold Fast: The Mission of God and the Obstacles of Man. Cooper shares stories of those who have overcome each struggle and provides encouragement to keep the reader moving forward. » Know students or others who could use this book? Get copies for them and one for yourself, then read and discuss it together. 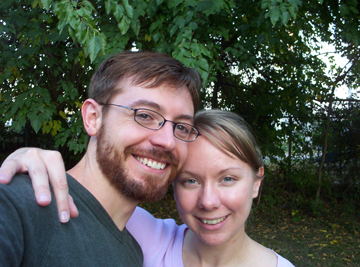 This issue’s interview is with Chester and Amy Davis. I’ve known them both for more than ten years now. They presently live with their four young children in Lincoln, Nebraska while Chester works on a mechanical engineering degree. They present some ideas here that are challenging and outside of the norm; I was hoping for this when I emailed them about doing an interview. In their own words, they are living intentionally. Their intention: To serve God in the area of missions that uses their gifts and fills a need. They are as dedicated as anyone I’ve personally known in living out this desire. While not everyone will agree with all of their observations or exhortations, the sacrifices they’ve made along the way are something every aspiring missionary needs to seriously consider. This will be the first in a two-part series. Propel: You’ve expressed concern about the amount of support required of missionaries by some mission organizations. Can you elaborate on this concern? Chester: For some reason we, here in America, have bought into certain aspects of the “health and wealth” gospel, and it shows up in support raising. It’s simply un-Biblical to require that God provide exactly how we dictate in order for a person to be in full-time ministry. Secondly, it is outrageous to require that if God wants to use me in ministry that He must provide an income greater than that which be paid a worker in the most wealthy country in the universe. Amy: It’s interesting to me that people in some vocations can make a lot more being a missionary than they could in the area of their training. For example, a degree in English or history or speech doesn’t generate high pay. But a missionary is paid not for his training or according to his skills, but what is considered a “reasonable living.” This seems (to me) to support a lifestyle roughly equivalent to $60-$70K USD annually. Also, a missionary’s wages increase with the number of dependants. What other field does this? In our last issue I requested your input to help shape M-DAT’s new web resource for aspiring missionaries. We have had an amazing response, 350 completed surveys to date! Wow. Thank you so much to all of you who took the time to give us your valuable input. I wanted to share with you some of the highlights from the survey. Respondents overwhelmingly affirmed that the video segments we described would be “helpful” or “very helpful.” 75 to 90% of people responded this way for each segment type. We take that to mean we are on the right track! We learned that people have high speed internet and like to watch video clips. Almost 95% said they had high speed internet and 80% reported watching video clips on the internet everyday to a few times a month. We learned it takes a long time to get to the mission field! Roughly 50% have had the desire to become a missionary for more than five years. 70% expect it will be at least another two years before they make it to the mission field as a full-time missionary. More respondents than we expected indicated they had nailed down some specifics on the who, where, and what questions, but a significant number still had outstanding decisions to make. Roughly 40% said they either did not know or only somewhat knew what type of missionary work they wanted to do, what type of training they would need, or where in the world they would like to serve. 60% do not yet know what organization they want to serve with. Finally, we had several hundred excellent responses to the open ended questions. Those responses are already influencing some of our decisions for the new web resource. The survey exceeded our expectations of learning about the needs of aspiring missionaries. We are so grateful to all who participated! Casey and Traci Letellier are on a mission to serve with Innovista. For the past four years, Casey — a Minnesota native — has been the graphic designer for a mission organization based in Denver. Traci — born and raised in Arkansas — is a writer and folk musician. Propel: You are in the midst of fundraising for a term in the United Kingdom. Did you receive any type of training before beginning the funding process? Letelliers: Yes. It was fairly informal training. Jason Lane, the director of Innovista International, spent a day with us to help strategize a fundraising plan and an initial time table. We’ve also received lots of good advice from our missionary friends and acquaintances along the way — something we really value. P: How has the support raising process been different than your expectations? L: We didn’t fully realize how many missionaries were already being sent from this area [northwest Arkansas]. Many of the people traditionally interested in missions work are already giving to their capacity and are unable to help anyone new. Some of our most generous support has actually come from people about our age who are just getting established in their jobs and are interested in missions. But then again, one of our most generous supporters is a World War II veteran. P: From your experience, what word of advice or encouragement would you offer to others preparing to begin the support raising process? L: At times we felt the expectation (and have received advice) suggesting that to be effective we needed to approach our support raising as we would a political campaign, and use carefully chosen emotive terms throughout our presentation. One time in particular, we received this kind of advice and went away really discouraged because taking an approach like that would be completely inauthentic to who we are. While the support-raising process is almost certainly going to be stretching, and some serious hard work no matter how you go about it, it seems to us that support raising shouldn’t require you to be people that you’re not. We’re still figuring out how this looks for us. One thing that we have found is that we usually connect better with individuals or small groups, rather than a crowd. Another thing we would encourage other missionaries to do is to present your vision with excellence and sensitivity to the audience before you. There is an old stereotype that identifies missionaries as a certain hyper-spiritual sub-group of believers who tend to look a certain way and talk with their own insider jargon. This stereotype does a disservice to the Church by pigeon-holing a certain group and alienating Christians who might excel at some mission-related work but just don’t fit the look. Do your part to help do away with this dated missionary stereotype! Obviously, any missionary raising their own funds would like it to be finished as quickly as possible. We initially hoped to leave for the field in January, so we found places for our stuff and moved out of our home in December. It is now April. We’ve been living out of a suitcase without the privacy of our own home for about four months. This has been hard at times, but we still think it was a good decision. We think it was a clear demonstration to our community of our determination to go as soon as possible. It has also been good to make a clean break from our ‘former’ life and focus on support-raising full time. Neither of us are big risk-takers by nature, so embracing this time of transition as an adventure has been incredibly helpful. The word “adventure” does such a great job of communicating the feeling of discomfort and occasional peril, but also of joy and occasional triumph. As silly as it may sound, it has really summed up our experience so far. Finally, as you embark on this adventure, make your plans and set your time-frame — but beyond this, trust God. When things don’t go according to your plan or time-frame, try not to lean on your own understanding or limited perspective. Like we’ve been discovering, you can’t know exactly what God has in store for you. No matter what kind of successes or set-backs come your way, acknowledge that God has not left you to wander aimlessly. He has a purpose for you — even now — even during the times of transition. P: What has discouraged you the most in the fundraising process? L: We’ve been discouraged to encounter many people who are just too busy and their schedules too full to even take the time to hear about what we’ll be doing. This is especially discouraging because we’ve pretty much dismantled our former life in order to go. Sometimes we’d just like people to get excited with us about this adventure God has us on, even if that’s as much as they can offer right now. P: How have you overcome these obstacles? L: Once we get the chance to sit down with somebody and explain the nature of our work at Innovista, they usually get it. I think a lot of people enjoy and are even encouraged by having their idea of missions and, even more specifically, their idea of evangelism expanded. L: Ten years from now we see ourselves on the sending end again — praying for and giving to other missionaries. The whole experience of being one of the sent has been so valuable for us! We’ve discovered just how vital it is to have a team of people who are willing to stay on the home front and do the work of sending others.